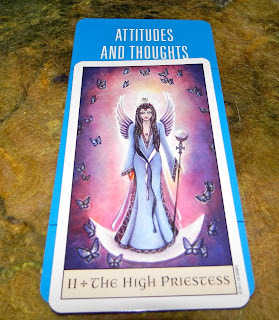 Today's Draw: High Priestess in the Attitudes and Thoughts position from the Crystal Visions Tarot and the Deck of 1000 Spreads. What things do you do with absolute surety? And what everyday things tend to make you hesitate or even freeze up? How sharp is your "knowing" in so far as what you're capable of? OK. Now on to why you're REALLY here. 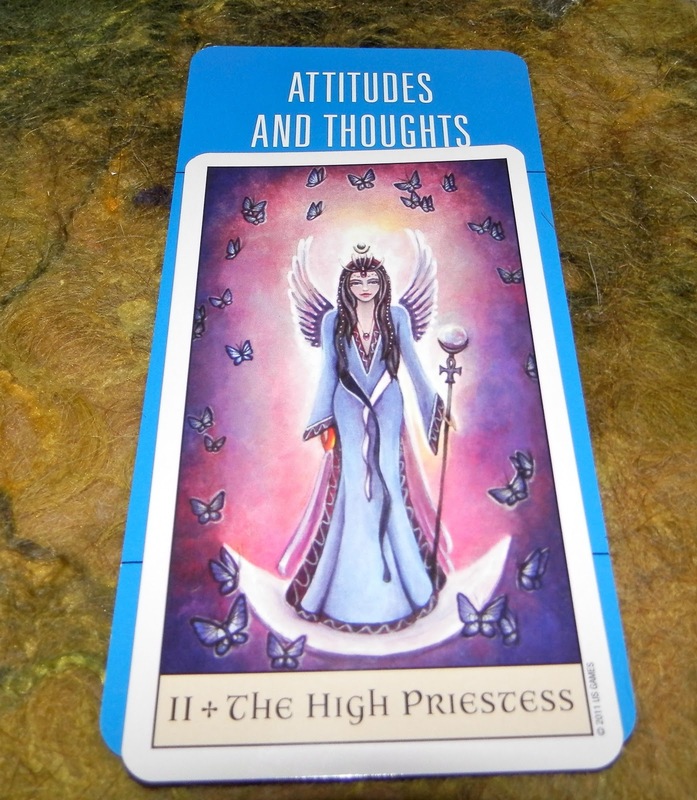 Since the Attitudes and Thoughts position is usually in relation to some stated topic of a reading, today we're going to consider it as a recommend way we approach life in general. And that recommendation comes from the High Priestess, the queen chick of intuition, deeper meaning, magick and unseen energies. The ankh on her staff speaks of eternal life. The High Priestess need only think of something and it's there. And as for what is unseen in this world, her eye see beyond the veil. She is, in many ways, pure instinct and trust, wrapped in a blanket of absolute knowing. I like that I got this card because it lets me talk about the squirrels that live in my tree. They never cease to amaze me with their athletic feats. Tonight as I was watching this one guy fly surely through the air between tree limbs, only to scurry up to the telephone wire, then along the wires that run throughout my neighborhood—what I call the Squirrel Superhighway—I wondered, "what if we were so sure?" These little guys run at breakneck speed along a wire that's akin to a balance beam for us. And they think nothing of it. They think nothing of leaping off the top of a house and into a tree six feet away. They just leap, fully attuned to their physical capabilities, the workings of geometry and the laws of physics. Longtime readers will know that I watch these guys from birth through adulthood. Sure, they see other squirrels do it. And some of them are more timid than others. But when the time comes to do it, they just do it. Then they never think of it ever again. In my human mind, I see that they're risking their lives every time they do it. One false step and they fall 20 feet into the waiting mouths of my pooches...if they live to be eaten alive, that is. But none of this ever seems to be on their minds as they scurry along impossibly narrow wires, branches and fence tops. So I was watching him and thinking, "what if we lived our lives so surely and confidently?" I'm the fraidy cat that can't manage any sort of incline without inching down it, lest I slip. But I wonder what our antics in our cars must look like to squirrels? The way we weave in and out of traffic with nary an accident? So there are things we do just as daring, but I'm not sure I see the level of trust and "knowing"in us as in other animals. And I wonder, "what if?" Would we all live very short lives, ending in flames of glory? Or would we accomplish far more than we know we're capable of? What do you think?